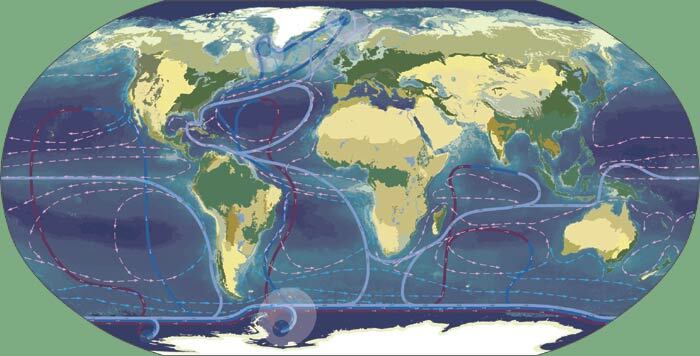 Driven by temperature and salinity gradients, the thermohaline current (THC) travels a 1,000 year circuit bringing cold water and nutrients up from the deep ocean and moving warmer water from the tropics toward the poles. Part of the earth's ocean circulatory system, this huge current moderates the potential extremes of climate, temperature and rainfall. Industrial air pollution from the developed world is carried on the dominant wind currents up to the arctic. After settling onto the tundra, snow and ice it is absorbed into the food chain. The people and creatures there have some of the highest concentrations of toxins in their bodies of anywhere on earth. Biodiversity is the variety of life found at all levels of biological organization, ranging from individuals and populations to species, communities and ecosystems. A population is a group of individuals of the same species in a given location - a group that is genetically different from other such groups. Species are made up of one or more populations. There were an estimated 2.2 billion populations on Earth. populations are going extinct at a rate of 32,000 per day. The loss of populations is occurring three to eight times faster than species loss. If all of a species' populations but one are destroyed the species technically still exists. However, all of the beneficial interrelations flowing from those populations and their biodiversity will have been lost. Some of the sun's energy is being blocked from reaching the earth by air pollution. Because the dirty air reflects light away from the earth before it reaches the ground, it has significantly reduced the reception of solar energy - calculations of the effect (from 4% to 30%) vary from region to region. As this type of air pollution is reduced, the amount of energy absorbed by the earth will increase - possibly contributing dramatically to global warming and climate change. Ozone gas in the upper atmosphere filters out the sun's ultraviolet rays and protects life forms from overexposure. This layer has been polluted by human activities and has developed thin areas or "holes" which let in more damaging levels of UV radiation. This in turn adversely affects many life forms - plants, animals and humans. Even after the various chemicals causing this effect are no longer being released, it will be decades or centuries before their disruptive effects disappear. As of april, 2005 at least 13 nuclear reactor fuel cores, 8 thermoelectric generators, and 32 nuclear reactors are known to be in Earth orbits below 1700 km. Before 1961, the entire Earth satellite population was just over 50 objects. Now earth orbit is cluttered with: ~11,000 objects bigger than 10 cm, of which ~9,000 are catalogued and tracked (~8000 are of US or USSR origin) - including around 600 functional spacecraft; ~100,000 objects from 1-10 cm -- too small to track, dangerous to spacecraft; and several million objects smaller than 1cm. What are they? Jettisoned mission junk, rocket fuel, space station garbage, abandoned rocket parts, used nuclear reactors, leaked radioactive coolant and exploded bits (~150 unplanned explosions of rockets and satellites have occured to date). Collisions between orbiting debris make even more debris. Hundreds of close passes (less than 1 km apart) occur daily between catalogued objects. Each year around 100 objects fall out of orbit and survive re-entry, crash landing somewhere on earth. Dozens of earth orbit satellites launched by the USSR and the USA between 1965-1988 used nuclear power. Several have fallen out of orbit and crash landed. Nuclear power systems are being considered for projects in the next decade. About 75 - 100 new satellites are launched each year.